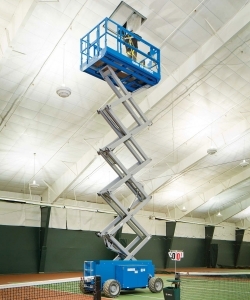 The Genie scissor lift offers unmatched performance and versatility. 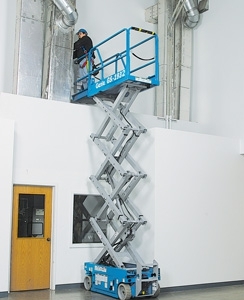 Genie Electric Scissor Lifts operate with low noise levels, and zero-emission, offering excellent capacity and maximum workspace. 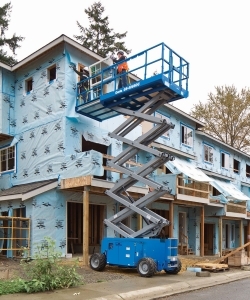 Ideal for manoeuvring in tight spaces, they’re excellent for both indoor and outdoor construction, maintenance and installation applications that have firm level services. 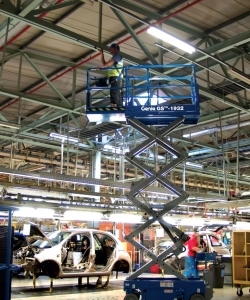 Genie Diesel or Bi-Energy “Rough Terrain” Scissor Lifts are all available with automatic-levelling hydraulic outriggers and oscillating axles, which sense the terrain and adjust the axle position based on ground conditions. Ideal for increasing productivity on demanding outdoor work sites. Impressive lift capacity of 272kg. working height 6.4m. Only 0.76m (30in) wide, so will pass through most single doors. Internal use only machine. 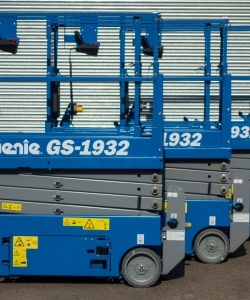 272kg lift capacity and at only 1.83m in length, is perfect for confined spaces. External use for one person or internal use for two people. At 0.76m (30in) wide, will pass through most single doors. 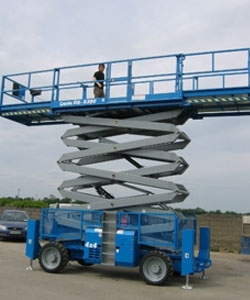 Working height of 7.60m and lift capacity of 227kg. 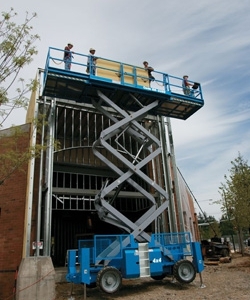 7.60m working height, compact, only 0.83m (32in) wide and 1.83m in length. External use for one person or internal use for two people. 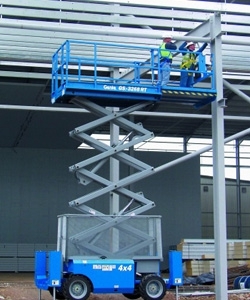 2.44m long, with working height of 7.9m and increased lift capacity of 363kg. 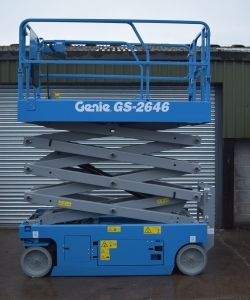 Only 0.81m (32in) wide but gives the operator a maximum working height of 9.80m with lift capacity 227Kg. Internal use for two people. Narrow machine, only 0.81m (32in) wide. 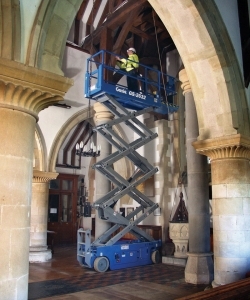 Self-levelling outriggers enable a maximum working height of 11.50m. 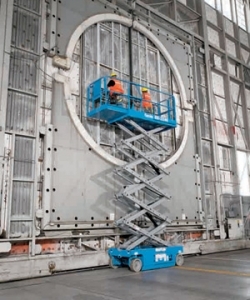 Massive lift capacity of 544kg and only 1.17m (46in) wide. 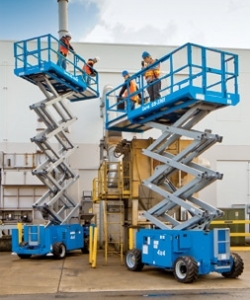 Can be operated both internally or externally with 2 people in the platform. 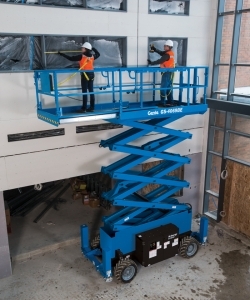 454 kg lift capacity and a roomy 1.15m wide, extendable platform. Working height 9.8m. For internal or external use with 2 people in the platform. 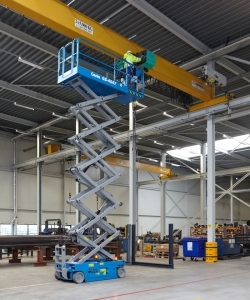 Combines of 11.50m working height with 1.17m width and lift capacity 318kg. 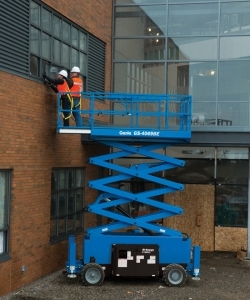 Relatively compact machine, reaches working height of 13.70m in 70 seconds. Battery pack for extended working time. 3 person platform internally. 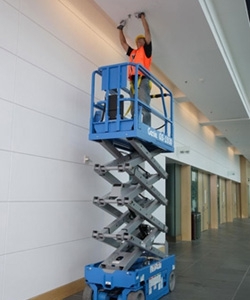 Genie's smallest wide base electric scissor lift, working height of 9.70m. 1.75m wide, lift capacity 680 kg. 4 person platform for internal/external. 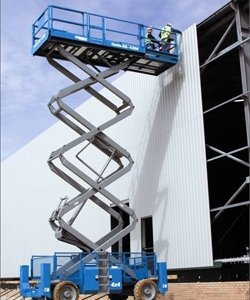 9.7m working height, lift capacity 680kg. Diesel generator and battery modes. 4 person platform for internal and external use. 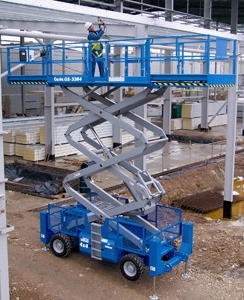 Maximum working and drive height of 9.70m, lift capacity 680kg. Enhanced horsepower to improve performance. 4 person platform for external use. Working height of 11.75m. 1.75m wide, lift capacity 454 kg. AC power drive system for improved performance. External use for 2 people or internal use for 4 people. 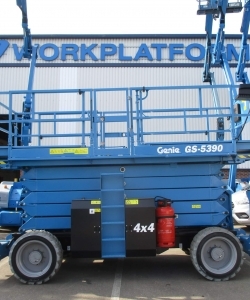 11.75m working height, lift capacity 454kg. Diesel generator and battery modes. External use for 2 people or internal use for 4 people. 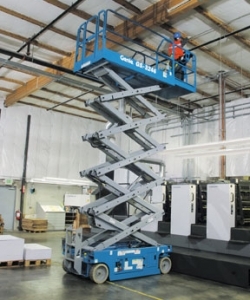 Maximum working /drive height of 11.75m, lift capacity 454Kg. Suits extreme jobsite conditions. External use for 2 people or internal use for 4 people. Massive full drive height of 14.12m, lift capacity 363kg. Ideal for internal / external use. External use for 2 people or internal use for 4 people. 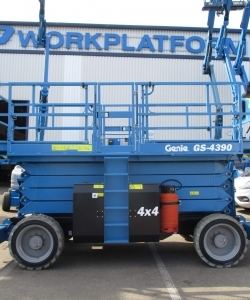 Full drive height of 14.12m, lift capacity 363kg. Diesel generator and battery modes. 3 person platform for internal use, 2 people for external use. 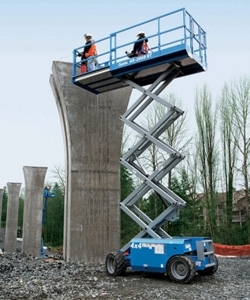 Maximum working/drive height of 14.12m. Lift capacity of 363kg. Suitable for rough terrain. 3 person platform for internal use, 2 people for external use. 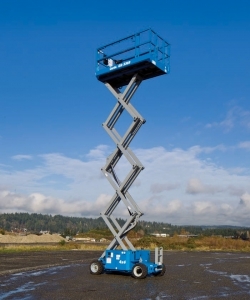 Rough terrain machine with 50% gradeabilty and allows up to 7 people to work at a maximum working height of 11.94m. Lift capacity 1134kg. Rough terrain machine with oscillating axles for difficult terrain. 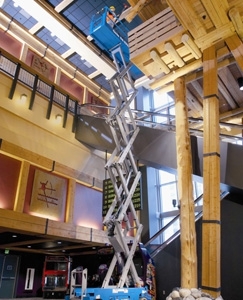 Allows up to 7 people to work at a maximum working height of 11.94m. Lift capacity 1134kg. Rough terrain scissor with excellent durabilty. Max working / drive height 14.75m. Lift capacity 680kg. Genie's largest rough terrain scissor, is now gas powered. 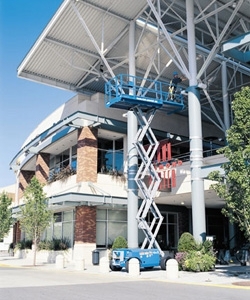 Max working height of 17.95m with a drive height of up to 9.14m. Lift capacity 680Kg. 4 person platform. 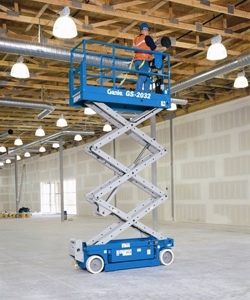 Genie's largest rough terrain scissor, max working height of 17.95m, drive height up 9.14m, with 40% gradeability. Lift capacity 680Kg. 4 person platform.